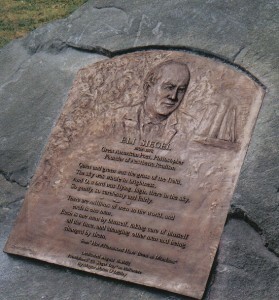 Reproduced here is the printed program given to the people who attended the Dedication of the Eli Siegel Memorial on August 16, 2002. The program included an address by Ellen Reiss and others speaking about Eli Siegel. They are also presented online. Robert Adams, President, Bolton-Park Neighbors, Inc.
Dave Matthews, Butler Stone Quarry, Butler, MD, with Anthony Taylor and Walter Stowers, for the installation of boulder and plaque; Allied Contractors, Inc., Baltimore, MD, for the assembly and installation of benches; Dale Laurin, AIA, architect, for providing detailed site drawings; James P. Reger, Principal Geologist, Maryland Geological Survey, Baltimore, MD; Sandy Jones, D.M. Stoltzfus & Son; Elk Mills Quarry, MD; Joe Vinci, Vinci Stone Products, Inc., Marriottsville, MD; Brad Rosenberger, Rohrer’s Quarry, Inc., Lititz, PA; Jim Strickland, Maryland Stone Service, Inc., Baltimore, MD; Frances Ferguson, for providing beverages; Alan Shapiro, for two musical arrangements; Anne Fielding, Devorah Tarrow, and Ernest DeFilippis for their assistance in the preparation for this dedication. The bronze memorial plaque was cast at the New Foundry New York. Kimberley M. Amprey, Interim Director of the Dept. of Recreation and Parks, was formerly an analyst in Mayor O’Malley’s CitiStat office. Margot Carpenter,* originally of Miami, is a poet and, along with teaching Aesthetic Realism in consultations and seminars, she is Executive Director of the Aesthetic Realism Foundation. Published on love and women’s issues, she is also an authority on dance and was a soloist with the Miami Ballet. LaVerne Fields is Community Leader of the Lakeside Garden Residents Association, Baltimore. Edward Green is a composer and teaches on the faculties of Manhattan School of Music and the Aesthetic Realism Foundation. He recently spoke on Aesthetic Realism and the music of Duke Ellington at Baltimore’s Eubie Blake National Jazz Institute. In September a work of his will be premiered at the Kennedy Center in Washington, DC, by Prism Brass and saxophonist Dale Underwood. Chaim Koppelman,* designer of the Eli Siegel Memorial, began his study with Eli Siegel in 1940. He is on the faculties of the School of Visual Arts and the Aesthetic Realism Foundation. His prints are in the collections of the Museum of Modern Art, Metropolitan Museum of Art, Los Angeles County Museum, Victoria and Albert Museum in London, Guggenheim Museum, Philadelphia Museum of Art, the National Gallery, and others. He is a member of the National Academy of esign. of Women in the Arts, Washington, DC. Timothy Lynch is President and Principal Officer of Teamsters Local 1205 in New York, and an Aesthetic Realism Associate. He has been interviewed on radio and TV, and been published on Aesthetic Realism and economics in major newspapers, including the Los Angeles Times, the Wall Street Journal, the Star-Ledger of New Jersey, as well as in many union periodicals. Allan Michael is a Maritime Captain and photographer. On September 11, 2001, working for Circle Line Tours, he ferried people from New York safely to New Jersey. His photographic work has been exhibited at the Terrain Gallery, NYC, and the Craven Gallery’s “Emerging African-American Artists” show in Martha’s Vineyard, was part of the traveling exhibition “Art Against Apartheid,” and has appeared in Essence magazine. Mr. Michael is published on the subject of how Aesthetic Realism can end racism. Monique Michael was born in Port-au-Prince, Haiti, from which her family fled in 1965 to escape the brutal Duvalier dictatorship. She has been an elementary school educator for the past 10 years, and has written articles and conducted workshops at educational conferences describing the success of the Aesthetic Realism Teaching Method. Robert Murphy* has written and spoken on Aesthetic Realism’s understanding of such diverse subjects as economics, love, and the cause of and solution to youth violence. With Barbara Allen,* he teaches young people in the “Learning to Like the World” class at the Aesthetic Realism Foundation and in classes at youth centers throughout New York. North Carolina, Pennsylvania, and Maryland. The Right of Aesthetic Realism to Be Known, her commentaries on world events, literature, history, and the human self have been educating people worldwide. She is considered by many people the foremost educator in the world today. Jaime Torres, DPM, is Chief of Podiatry at Coler-Goldwater Memorial Hospital in New York, and an Aesthetic Realism Associate. He is on the advisory boards of The National Hispanic Medical Association and the National Diabetes Education Program. His articles on healthcare have been published in Spanish and English newspapers and professional journals. With Dr. Perey, he spoke at the Campus Outreach Opportunity League’s National Conference at Harvard University, on Aesthetic Realism and how prejudice can end.